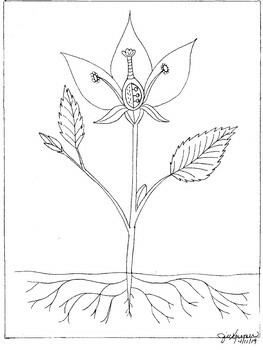 This hand-drawn coloring page can be used to name most of the parts of a flowering plant. I have drawn the primary root, lateral roots, stem, leaves, axillary bud, terminal bud, receptacle, sepal, pistil (including the style, stigma, ovules, and ovary), stamen (including the filament and anther), and the petals. So you can concentrate on just the areas you are teaching, I did not draw arrows or lines denoting the different parts of the plant.